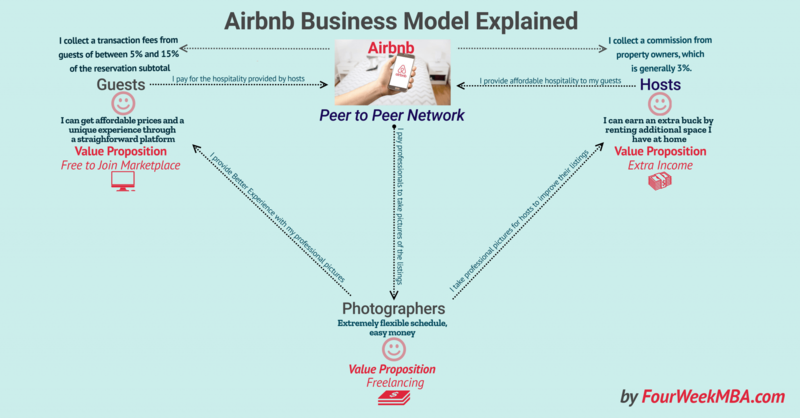 As a peer to peer network, Airbnb allows individuals to rent from private owners for a fee. In fact, Airbnb charges guests a service fee between 5% and 15% of the reservation subtotal; While the commission from hosts is generally 3%. Airbnb also charges hosts who offer experiences a 20% service fee on the total price. How much money does Airbnb make? Airbnb made $93 million in profits on a $2.6 billion revenues. This means the company net margin was 3.58%. That seems a low net margin compared to the 9% from the hospitality industry. However, Airbnb is a startup gaining traction and market share over traditional players. Also, its business model is based on the growth of its users base. How much is Airbnb worth? What are the key partners for Airbnb? What are two key issues to Airbnb success? In March 2017 the company was valued $31 billion. As of that date, the company had $5 billion at the bank, and it rejected an investment offer by SoftBank. Airbnb might be the biggest tech unicorn IPO in 2018. There are also other partners, from which it depends on the platform success, like IT experts, and interior designer. Guests (travelers) can easily find hosts (pretty much anyone with a private home for rent) through the Airbnb marketplace. Also, Real estate agencies that have vacant units can use Airbnb as a way to rent the excess properties they were not able to rent on the market. Instead, freelance photographers can earn a living by joining Airbnb as independent contractors. There are several value propositions for both hosts and guests. And for freelance photographers. What is the revenue generation model? 1. It collects a commission from property owners, which is generally 3%. While it collects a commission fee from the same owners offering experiences, which is generally 20%. When hosts are listing their rooms and homes, they’re trusting the platform to put them in touch with good people. The same applies to guests. Would this trust be eroded over time so will be the value of the marketplace. Travelers nowadays have plenty of options. If they revert back to hotels or other solutions, Airbnb loses momentum. Also, another risk might be that of losing guests that make friends with hosts. In fact, they might choose to organize their next transaction privately. The paradox then is that Airbnb rather that strong incentive tie between hosts and guests. It has to create an experience so that both parties can trust each other enough to make the transaction but not so much to get out of Airbnb marketplace. Airbnb is a start-up unicorn that disrupted the hospitality industry. As of 2017, it made $93 million in profits on a $2.6 billion revenues. Also, back in March 2017, it was valued at $31 billion. There are three key strategy“>strategic partners: hosts, guests, freelance photographers. The revenue generation model is quite simple and its based on a commission fee of 3% on hosts (while 20% for hosts is offering experiences) and a transaction fee of 5-15% over guests. Two main risks that Airbnb faces as a peer to peer marketplace are trust and customer retention. The company is growing quite fast, and it is planning to get listed. Will this growth continue?